Elliptio complanata are medium to large sized freshwater mussels of the family Unionidae. Most Unionidae mussels in their larvae stage need to attach themselves to a host fish to in order for the larvae to survive and metamorphasize into juveniles . The larva that are released from mature Unionidae mussels are called glochidia. Some mussels simply release glochidia into the water where by happenstance they can contact with the appropriate fish host as it swims by. Other mussels of this family have a more intricate process such as acting as a kind of lure to attract host fish to them or sending out glochidia in tiny structures that trick host fish into thinking they are food. One the glochidia get attached to the the gills or the fins of the right fish host , they must embed themselves enough that the host's fish tissue grows over the glochidia. Metamorphosis into microscopic juveniles takes place over days or weeks, depending on species and temperature. Finally, a new mussel bed is created if the juveniles fatefully manage to drop off into a suitable habitat. You'll find most Elliptio species sticking up with some of their shell bodies burrowed into the substrate. The interior of the shell has a kind of mother-of-pearl silvery or purplish look. Bivalve molluscs such as the Elliptio have their bodies enclosed by 2 shells joined together by a kind of a hinge ligament. The shell of a bivalve is composed of calcium carbonate. Unionoids sift phytoplankton and zooplankton, as well as suspended bacteria, fungal spores, and dissolved organic matter. There is no certainly into which of these filtered items are actually processed as energy. In some cases of high populations, water clarity may be influenced but is dependent on many factors some of which include: water temperature, current velocity, and particle size and concentration. 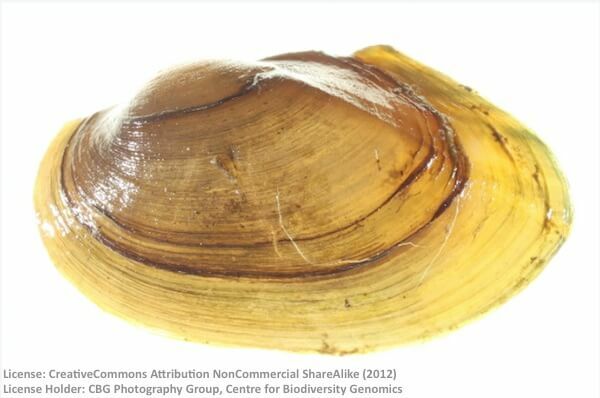 In general, freshwater mussels are a food source for fish, mammals and birds. 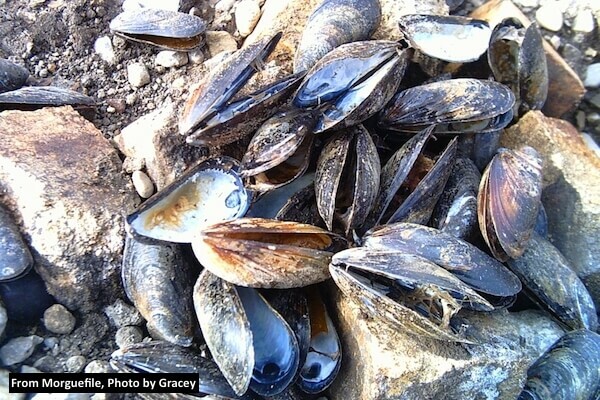 Empty mussel shells can be used for fish to lay eggs, a refuge for crayfish and insect larvae. They are sensitive to pollution and habitat changes. Because they are filter feeders and accumulate toxins, they serve as early indicators of environmental degradation and are not recommended for human consumption as they may be filled with concentrated toxins.